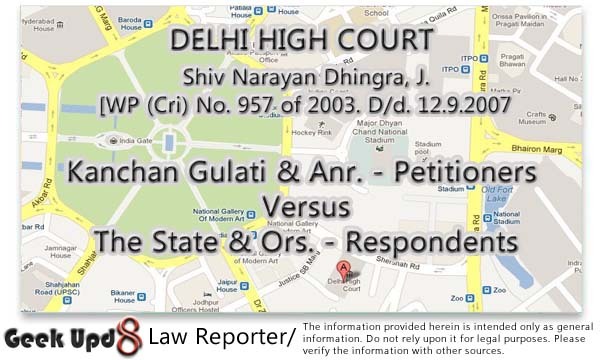 DELHI HIGH COURT Shiv Narayan Dhingra, J.
Mr. S.S. Gandhi, Sr. Advocate with Mr. Vishal Gosain, Advocate, for the petitioner; Ms. Mukta Gupta, Advocate, for State Mr. Rahul Goyal, Advocate, for R-4. B. Constitution of India, Articles 226 and 227 - Indian Penal Code, 1860, Sections 406 and 498-A - Criminal Procedure Code, 1973, Section 482 - Once a competent Court has passed order regarding dispute and same has not been challenged then that case cannot be revised again on same issues. This writ petition under Article 226 of the Constitution of India read with Section 482, Cr PC has been made for quashing of FIR No. 277/ 2003 under Section 498-A/406, IPC registered at Police Station New Friends Colony, Delhi. 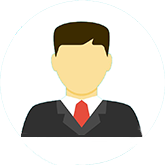 Petitioners are mother and brother of the former husband of the complainant (ex mother-in-law and brother-in-law of the complainant). 2. In the FIR, complainant stated that she was married to Anuranjan Gultai R/O 3245, N. Oakland Avenue Milwaukee, WI 43211, USA on 13.08.1993 at New Delhi. In marriage, her parents spent Rs. 2.5 lacs for expenses towards reception of guests, gave various articles and gifts worth Rs. 1,46,000/- and an amount of Rs. 4500/- was paid to Anuranjan Gulati by cheque. Anuranjan Gulati was a computer engineer working in USA. Marriage took place in Jai Krishna temple at Pitampura. Her parents paid for her ticket to USA at the time when she left for USA to join her husband. Her precious and heavy jewellery were kept in India by her mother-in-law and brother-in-law. She went to USA however, the attitude of her husband in USA was not good towards her and he started harassing her physically and mentally. 3. On 6.5.1997 her husband filed a divorce petition in the Circuit Court of USA. She contested the divorce petition which was later withdrawn by her husband on 3.6.1998. Her husband shifted his residence from Lake County and on 31.8.1998, he filed another petition for divorce in the Circuit Court, Lake County, Illinois, USA. She hired services of another lawyer and contested the divorce petition to her might. However, vide order dated 31.3.1999 divorce petition was allowed and marriage was dissolved. In the order, the Court asked for exchange of dowry and other articles etc but the same were not returned to her either by her ex-husband or by her mother-in-law or brother-in- law. She approa- ched the Appellate Court in USA and challenged the decree of the Trial Court. The appeal was dismissed. She alleged that she could not pursue the legal remedy in USA properly due to financial constraints. She came back to India on 31.7.2002 thereafter, she lodged this FIR on 1.6.2003. 4. Quashing of this FIR has been prayed for by the petitioners. It is argued by the counsel for petitio- ners that no offence has been committed by any of the petitioners. There are no allegations of cruelty against the petitioners. The complainant, after marriage left for USA and all along lived in USA till July, 2002. Even after July, 2002 she had not stayed with the petitioners even for a single day and there was no occasion for petitioners to harass her for dowry and perpetuate any cruelty. Complainant had left behind some jewellery articles and as per decree of divorce, which case was duly contested by the complainant, both the parties were to exchange certain articles. The ex-husband of the complainant had been all along writing to the complainant to take back those articles, but the complainant instead of taking back the articles, lodged this FIR. B. That they marital home located at 1258 S. Pleasant Hill Gate, Wakegan, Illinois has been sold and will close on or about March 31, 1999. That the net sales proceeds after paying all costs of sale and debt(s) on the home shall be equally divided between the parties. That any deficit from the sale shall be paid from the 3 Com Corp Stock owned by the parties. Utensils, species and other stuff from my relatives. I. That the wife and husband shall equally divide the 3 Com Corporation 401 (k) plan acquired during the marriage. That the wife's interest in the pension shall be evidenced by a Qualified Domestic Relations Order to be entered in these proceedings. One gold "krishna murti" pendant with diamonds. 6. The appellate order passed by the appeal Court would show that appeal was not dismissed because the appellant had not been able to engage advocate, as claimed, but it was dismissed on technical ground, since the appeal was filed beyond the period of limitation and without fulfilling the necessary requirements. After passing of the orders by the USA Court granting divorce and exchange of dowry articles, the husband had been writing to the complainant for exchange of articles and taking back all her articles, but the complainant had not received these articles deliberately; the letters written by the husband are on record. 7. Quashing of FIR in exercise of writ jurisdiction is a discretion of the Court. The Court should exercise discretion in rarest of rare cases, where the circumstances and the facts reveal that, even if, all the allegations made in the FIR considered as true, no offence is made out. In the present case, the complainant had all along lived in USA. She had left India immediately after her marriage. There are no allegations of cruelty or breach of trust during this period. The allegations are that her father spent money in marriage beyond his capacity. This does not amount to a dowry demand. If her jewellery or other articles were left behind in India with mother-in-law or brother- in-law, a Court of competent jurisdiction has passed an order in respect of these dowry articles and directed the parties for exchange of those articles. The decree passed by the Court of USA has not been challenged by the complainant. She herself submitted to the jurisdiction of the USA Court and contested the case. She was living, at the time of contesting the case, in USA and continued to live in USA event after passing of decree till 2002. She even preferred an appeal, which was dismissed. Thus, it is not a case where decree was obtained by her husband clandestinely or she had not submitted to the jurisdiction of the US Court or the US Court had no jurisdiction. Once a competent Court has passed an order in respect of return or exchange of articles including dowry articles, no offence under Section 406, IPC can be tried for the same articles in India. 8. I consider that it is a rarest of rare cases, where the Court should exercise its discretion. Criminal law cannot be allowed to be used to settle the personal scores neither the Courts can be allowed to be used as tools. The complainant, who lost her divorce case in USA and was in USA all along from 1997 till 2002 and had not stayed with the petitioners, even for a single day. She lodged this FIR only to settle her personal scores. I, therefore, allow this petition. The FIR No. 277/2003 under Section 498-A/406, IPC registered at Police Station New Friends Colony, Delhi is hereby quashed.